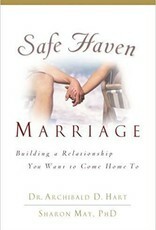 Creating a safe haven for each other in a marriage can enable a couple to weather any storm. Yet that accomplishment is certainly easier said than done. Psychologists Arch Hart, Ph.D, and Sharon Hart May, Ph.D., present a detailed blueprint for establishing a marital safe haven so that couples can count on each other and avoid criticizing, blaming and shutting out their partners during tough times. Based on a new therapeutic approach that involves establishing a feeling of "safety," out of which commitment and the other necessary elements of a lasting and fulfilling relationship can grow.